The 2nd annual charity dinner, hosted by Active Valor and sponsored by Batta Fulkerson Law Group. We look forward to you joining us for an amazing night of fun, festivities and good food. 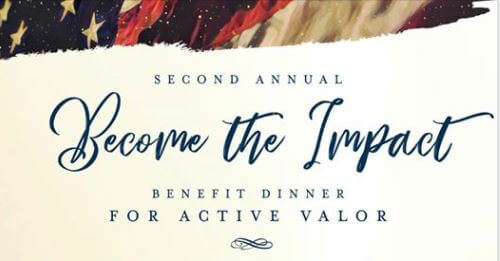 All proceeds from this special evening will be benefitting our Valor Adventures program that pairs transitioning veterans as mentors to children of our nation’s fallen heroes. Please join us for an evening of celebration and sharing an impact for our veterans and Gold Star Families. Active Valor is a combat veteran run 501(c)(3) non-profit organization in San Diego, CA dedicated to giving new purpose to veterans by pairing them as mentors to children of our nation’s fallen heroes, referred to as Gold Star Children. Active Valor is a wonderful cause. Your San Diego SCI Chapter sponsors some of their events and is listed on their website as a Title Sponsor Please consider joining us for this great event! The San Diego Chapter is SCI is listed as a TITLE SPONSOR on the Active Valor website. The event will include raffle prizes, silent auctions, live auctions and guest speakers.